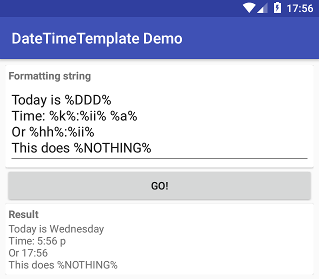 DateTimeTemplate is date/time formatting library supporting formatting placeholders. Download demo application APK from releases section. Source code in project's app/ module. %A% upper-cased abbreviated AM/PM marker. "A" for "AM", "P" for "PM"
%a% lower-cased abbreviated AM/PM marker. "a" for "am", "p" for "pm"
would produce GMT: Mon 16:25. Please report any issue spotted using GitHub's project tracker.